Students who work with Cynthia Venn, Professor of Geography and Geosciences at Bloomsburg University understand that getting wet is just part of the job. 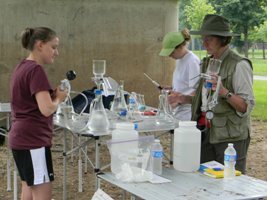 Together with Christopher Hallen, Professor of Chemistry, the researchers analyze the chemical content of the Susquehanna River. “Using canoes, or a small motorboat, students take water samples from multiple sites on the river including Danville, Shady Nook, Watsontown, and Milton,” says Venn. “They do really great work, and we haven’t lost a team over the dam at Sunbury yet!” In the field students consider the turbidity (how cloudy the sample appears) and filter the water to test for alkalinity and acidity. Once the life preservers come off and the lab coats are thrown on, Venn and her students continue their work on campus with specialized equipment. For those folks interested in doing their own scientific observations, Venn suggests heading to the Shikellamy State Park Overlook and viewing the confluence of the West Branch with the main stem of the river. “Anyone can be a scientist and see that the North Branch is murky and the West Branch clearer. Even past the confluence point, you can see this division with the naked eye the whole way to Harrisburg. It really is a segregated, divided river. Some say it could be considered two separate rivers because of a lack of mixing!” Venn says her team’s work along both branches can inform the work of her fellow river scientists, particularly biologists. “My team provides the chemistry and some baseline data which are particularly useful for biologists studying all the fish, insect, mammals and things that live in and along the water. If we detect changes in water chemistry there are likely important related impacts on the rest of the ecosystem.” This research is included in the Susquehanna River Heartland Coalition for Environmental Studies which is a collaborative effort among many scientists and you can learn more and see real time data feed at two sites along the river here.